The Project Acceptance Signoff Form is used for the client and developer to signoff on the final acceptance of the project. Use this form when the project is complete and both parties agree that the project conforms to the terms of the contract. This version includes additional release and indemnity clauses. It also includes advice on adding credit card information for customers paying by credit card to help reduce liability on chargebacks of services. product! I have been using this since 2008 and it has helped numerous times and saved me lots of money. I can customize them to make them my own." This Project Contract Acceptance Signoff Form (Verbose) is included in editable Word format that can be customized in Word or by using the included Wizard software. How do you write a Project Contract Acceptance Signoff Form (Verbose) document? General Description of Project Deliverables. Please initial the following sections, which detail the project's deliverables contracted between Company Name and Company Name, and sign the Acceptance of Agreement at the bottom of this document. Initials Description of Completed Milestone(s). Acceptance of Project per Contract Specifications. I certify that I have received the above project deliverables from Company Name, and that all deliverables have been demonstrated, delivered, or otherwise completed to Company Name's satisfaction. I further certify and release Company Name from any further obligation or duty unless otherwise agreed upon in writing. I understand that, by signing this agreement, I release Company Name from any and all liability, tort, or claim concerning this project. I further understand that all files provided to Company Name are to be used at Company Name's sole risk and responsibility and all files should be tested prior to sending them to press, replication, or any other mass-production. Company Name may now charge or invoice Company Name any outstanding monies owed for completion of the project. Best Practice Note: If billing by credit card, the above line should include permission to charge their credit card. This helps reduce your chargeback exposure. Example: Florentine Design Group, LLC may now charge the final installment of $390 to AMEX ************345 for completion of the project. 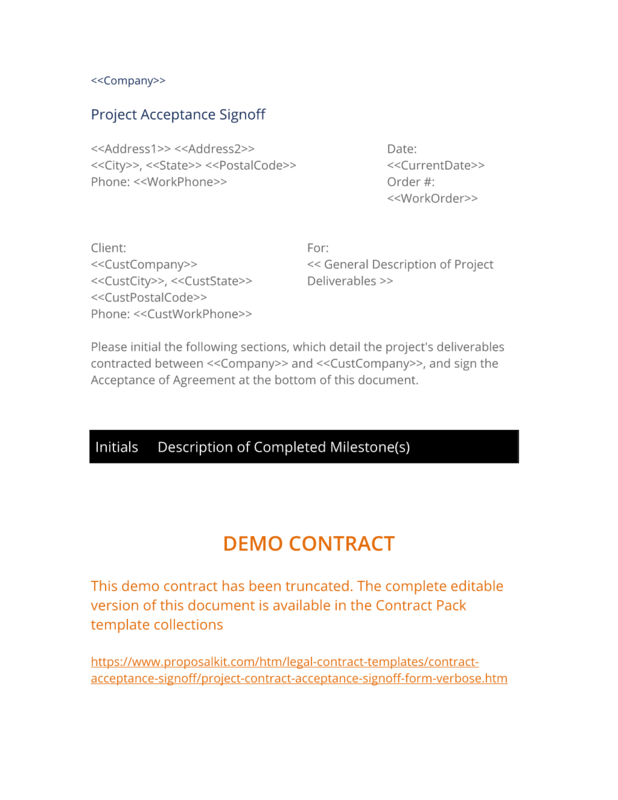 The complete Project Contract Acceptance Signoff Form (Verbose) - with the actual formatting and layout - is available in this Contract Pack.